candidanimal: What did I eat in Sapporo? Open any Japanese travel guide on Sapporo and almost every page is sure to be loaded with food. It seems Japanese tourists only venture to Hokkaido to eat. I did litter research before my Golden Week trip in this northern city, but luckily I stumbled upon some really delicious eats. My first night on the town I found this lovely taco rice shop. With only eight seats I ate at the bar counter in a tiny alcove. The origins of taco rice couldn’t be further from Sapporo. Originally a product of Okinawa, taco rice takes a traditional bowl of white rice and spices it up with ground meat, cheese, tomatoes, lettece, and sauce. I mixed a raw egg into my house-special sauce for a deliciously thick gravy. In the afternoon I wandered around in search of a place to eat Hokkaido’s famous kaisendon. It wasn’t easy. None of the department stores offered anything promising, and I had to resort to tabelog - like Japanese Yelp - which led me to a fish market and many small kaisendon restaurants. I ended up eating at a place with 4 chairs inside a plastic tarp tent. The uni was unlike anything I have tasted before. Firm enough to pick up with chopsticks, with a subtle taste that complemented, rather than overpowered the rice and fish. The ikura, rather than just being salty, was savory, and the hotate practically melted in my mouth. Another popular dish to eat in Sapporo in "Genghis", which is lamb. Being Greek, I am used to eating lamb as a child, but I had never seen it on a menu in Japan. In Sapporo, gengis lamb is cut into thin slices, and grilled on a BBQ at the table. It is served with bean sprouts, onion, and cabbage. The grilled lamb in then eaten with garlic and dipped into a thick brown sauce. This genghis is from Genghis Khan at the Sapporo Bier Garten. Soup curry is also a popular dish in Sapporo. Because it is so cold for most of the year, people love to eat something warm and filling. The taste of soup curry is somewhere between the sweetness of Japanese curry and the spice of Indian curry. The texture is closer to that of a gravy rather than a watery soup. Ordered the vegetable soup with rice and a pear lassi. This soup curry is from Lavi in Sapporo Station. 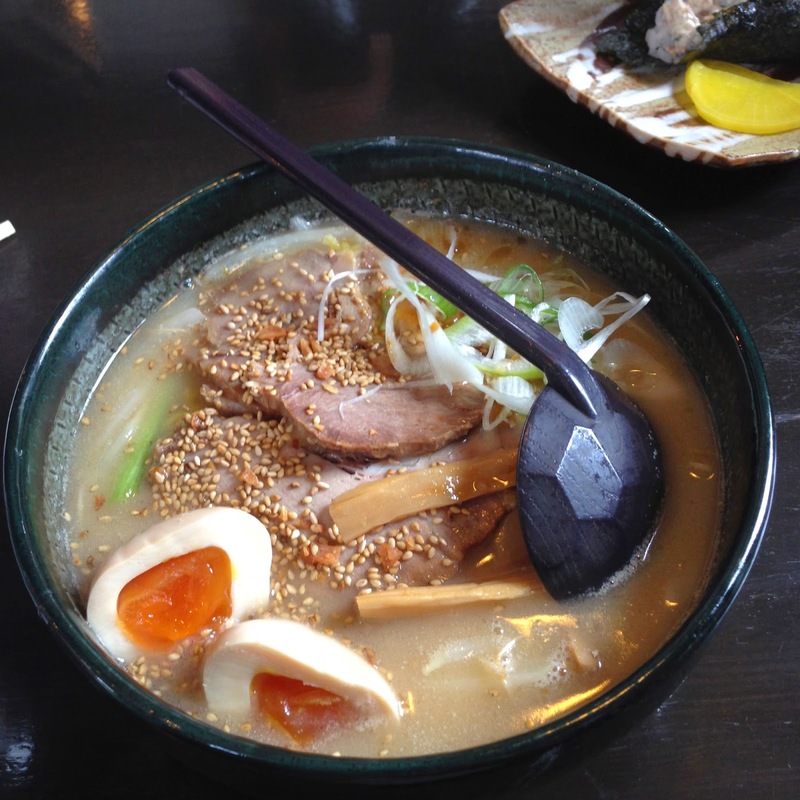 Perhaps the most famous dish of all in Sapporo is ramen. Ramen is found all over Japan but it different by city and region. Miso ramen was invented in Hokkaido and my expectations were high. Fortunately my friends took me to a fantastic restaurant, and I enjoyed their traditional miso ramen with a egg. Labels: 2014, Food, Hokkaido, JAPAN, JAPAN Sapporo, kaisendon, What Do I Eat?